Hurrah, it's that time of year again! 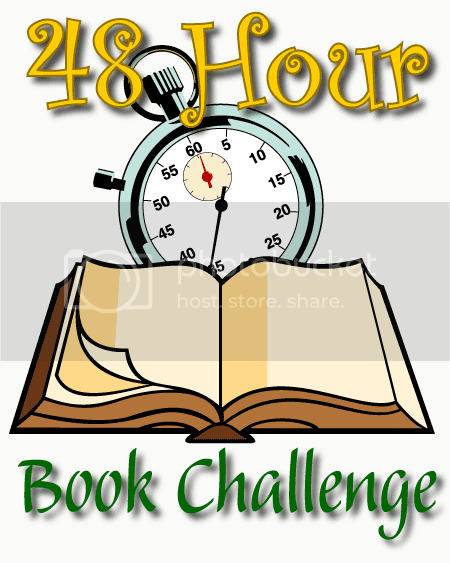 It's Mother Reader's Sixth Annual 48 Hour Book Challenge, set this year for the weekend of June 3-5. That means for some people, they'll be starting today. As for me, I'm getting started on Saturday. In years past, I've taken the 48-Hour Book Challenge as an opportunity to catch up on creating blog posts. Friends, I cannot even begin to describe to you the deliciousness of having a full month's worth of blog posts all ready to go. This year, my pile of books to be reviewed is as tall and scary as ever... and yet, I think I may be decadent and devote most of my marathon this year to simply reading, since my TBR pile shows no sign of abating, either. Happy Reading, Madigan! I'm going to try to write blog posts, but I oh, the idea of just reading is attractive.... Anyway, I'm sure I'll still manage to do more of that than usual. Hey, will you be going to ALA this year? Happy reading!! Hope you're finding books that you enjoy! Since the last week of school is next week, I have been saving some of my reviews as well. I don't think that anyone would really read them this weekend, so I might as well space them out! I am welcoming the chance to read things without having to write anything particularly thoughtful about them--much more freeing not to be reviewing, but just reacting! @Sondy - Yes, I am! I had been planning not to, but then, things just kind of worked out. I'm looking forward to it. Will you be there? We should have some kind of blogger's mini-meet-up. Meeting people with the help of Twitter worked out so awesome for me in Washington. @Abby - Thanks! I did enjoy a lot of my books, although there's one I'm tempted to write a lukewarm review of. @Ms. Yingling - I like to space out my reviews, too. I like a good balance of reviews and "other stuff"
@Charlotte - I'm loving your "quick thoughts" posts on all the reading you did this weekend!